Taste test: These were pretty good barbecue chips. The red seasonng on them had a nice, slightly sweet, slightly hot barbecue taste, and they left behind a hot, tasty lingering aftertaste. 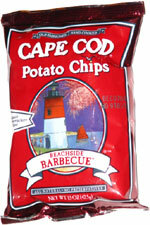 They were slightly less crisp than I would have liked, and they didn't have quite as much crunch as most of Cape Cod's other kettle-cooked chips. Smell test: Pretty good barbecue smell. Not sweet or hot.